Jamaal Bowman is always worth listening to. It is rare to find school leaders with vision and understanding of the damage high stakes testing has done and is doing. He even races against the kids in his school - he won a race in the gym wearing his suit and dress shoes. It's a shlep to the Bronx for me but I may take a shot at going up there Monday night, Feb. 5 at 6PM for his BLM week event - if my old bones can make it. But I am not racing Jamaal. The Global Tech teachers and students broke my heart. I almost lost it. Well, maybe I did lose it. Here is Vimeo with you tube link below. Lack of professionalism and common courtesy on part of the DOE. Everything was done to minimize community input and family engagement. DOE hasn't earned our trust. Going to a PEP where parents, teachers, students and community people show up to talk about being ignored, being ignored by yet another arrogant Farina superintendent, being lied to repeatedly and being used as a prop to give the impression the DOE admin is concerned about them is like watching a horror show in an endless loop. See the video of 4 CEC 3 members at the Jan. PEP calling out the DOE and Farina administration under de Blasio and if you want to dig further read their astounding letter - all 11 pages detailing the ills of the DOE that will never be fixed even though these parents honestly offer their services. Ending mayoral control is the only answer. At least at the local school boards we knew who to yell at. I'm reposting. I'll be there with camera - stop by and say a few words for our little film. 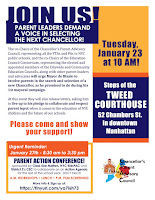 Our Parent Action Conference is just a few days away on Saturday, Jan. 27 at the Peck Slip School in lower Manhattan. Please sign up today if you haven't already! You can spend the day with fellow parent activists, learn how to advocate for your child and our schools, enjoy a delicious lunch and see a terrific movie; what could be better? Also, this morning we held a successful press conference along with CPAC and CEC leaders, representing more than one million parents and demanding that the Mayor give parents a voice in selecting a new Chancellor. Watch out for reports on NY1 and the Wall St. Journal. We're asking for a meeting with the Mayor to discuss how parents can provide input into his decision, to ensure that the next Chancellor has the qualities and qualifications necessary to run the nation's largest public school system and is someone who can truly collaborate with parents. Check out the oped I co-authored with Leonie Haimson in Gotham Gazette on this issue. Good story from LIndsay Christ who dug up the footage where de Blasio was running for mayor and promised to do a public vetting process. I reported on the magnificent PS 42 closing school info session in a recent column (the hearing is Feb. 13 at the school and I urge anyone who actually reads this column to come see how a school fights back) and followed up by attending the IS 53 session (not as exuberant but still significant – their hearing in Feb. 7 which I cannot attend) the next night where I had a chance to join the students, teachers and parents who defended the school in speaking. Many valid points were made at both schools about the seeming arbitrary nature of the decisions to close down schools that are branded as “failing” whereas the criteria being used seem to be moving targets with the outcomes influenced more by political than educational issues. Charters coveting space is often a factor, as is gentrification, both seeming to be operating factors in the decision to close the two Rockaway schools. In 12 years Bloomberg and his Chancellor agents Joel Klein and Dennis Walcott (yes the same guy running Queens libraries - one of the political outrages since his boss Bloomberg did more harm to the library systems of this city than any mayor in decades) closed 150 schools and opened scads of new ones, with some of them ending up on failing lists. De Blasio and Chancellor Farina promised something better. While the numbers of closings are far less, they still have the same negative impact on micro communities. The so-called “Renewal” schools – those branded as failing but given three years to improve – have come under severe attack by the forces of privatization funded by numerous hedge fund billionaires who would like to see entire public school systems turn into non-union privatized charters drinking at the trough of public money. They did that in New Orleans to disastrous effect. Trump Education Secretary Betsy DeVos has used her billions to create another disaster in the state of Michigan while nearby Ohio suffers one charter scandal after another. Well, actually so does Arizona, California, Florida – well I could go on but I will spare you the dirt. If interested, Google “charter school scandals” and watch the stuff spill out of your screen, like this lovely headline from the May 8, 2017 edition of Business Insider, “Are charter schools the new Enron scandal?” Oh, what fun! You might see commercials from an astroturf group like Families for Excellent Schools – FES – I refer to them as FEH!!!! They are oh so concerned with the poor children in these renewal schools and also love to attack the teachers who are forced to reapply for their jobs or else get tossed into the permanent substitute ATR pool. Of course let’s blame the teachers, as if the people running the DOE from the top to middle management have played no role. No one’s head rolls for putting in lousy administrators to run schools or the many awful Superintendents appointed under Farina who are supposed to supervise them. I watched District 27 Supt. Mary Barton sit there stone-faced at both Rockaway hearings while children and parents pleaded for their schools. Last week I taped an amazing event in East Harlem (District 4) – not the outright closing but the combination of two schools in one building – an elementary school, PS 7 and Global Tech Prep, a middle school. GTP was set up as a special school focused on tech in the very poor East Harlem community. The founding principal left and a teacher trusted by everyone in the school was supposed to take over to continue the vision of the school. But last April he was denied tenure and left – he is now at Harvard – and chaos reigned. Thus Farina and her Dist. 4 Supt agent of destruction, Alexandra Estrella, doomed both schools to a death spiral so they could execute a naked power play. I have loads of videos on my blog of the remarkable students challenging the DOE reps at a hearing and calling them “monsters.” Monsters indeed! If you still think these decisions are educational and not political, check this out. Some renewal schools have been rescued and are now in a program called “RISE.” JHS 80 in the Bronx is one such school spared the ax despite repeated reports that its principal, Emmanuel Polanco, is a horror story but is being protected. Sue Edelman, one of the top education reporters in the city despite working for the often despicable NY Post, reported that JHS 80 “is an educational hellhole. Despite receiving millions in extra dollars and services, the 655-student Norwood school suffers from out-of-control students, filthy, unsafe conditions and thuggish administrators who try to keep the horrors under wraps, insiders have told authorities.” ... NY Post, Jan. 6, 2018. Sue is by the way the niece of my former next door neighbor, Jean Mirkin, of Mirkin Vision Care fame on Beach 116th St. So Sue comes from good genes. Or Jeans. Norm’s genes are always on display at his blog, ednotesonline.com. Here are comments from a couple of parents talking about the impact of Global Tech on their children and some amazing teachers. These teachers are not only eloquent but brave. It's funny how we read so many anonymous comments on the blogs where teachers say how fearful they are. Not these teachers. I saw Estrella pass a note to the guy next to her when Kayla Hamilton was speaking pointing out her name. I called out - vendetta? When I told Kayla the story she said, "What else is new?" One reason we are taking aim at Estrella at the UFT to force them to take action and stop the collusion between her and District 4 rep Servia Silva. Here are the letters of support from a retired principal and DOE coach and the president of Southern New Hampshire University. Part 2 of the awesome student voices - (Part 1 is here). OMG - some of the most amazing students comments - lead off by this girl - a Muslim immigrant from Africa who just blows us away -- but one after another - all 5 of them -- heartrending stories of how Global Tech staff and fellow students became their family. A kid bullied in his old school, a girl from the projects whose brother was shot, a girl who behaved so badly she was tossed out of class regularly, a kid whose family was dysfunctional but Global Tech got her through it. And some disdain for the DOE. After viewing read the comments by founding principal Chrystina Russell being read tonight at the PEP which will vote to merge the schools no matter what these students, some of whom will be there tonight, along with their former teachers (their video will be going up later). 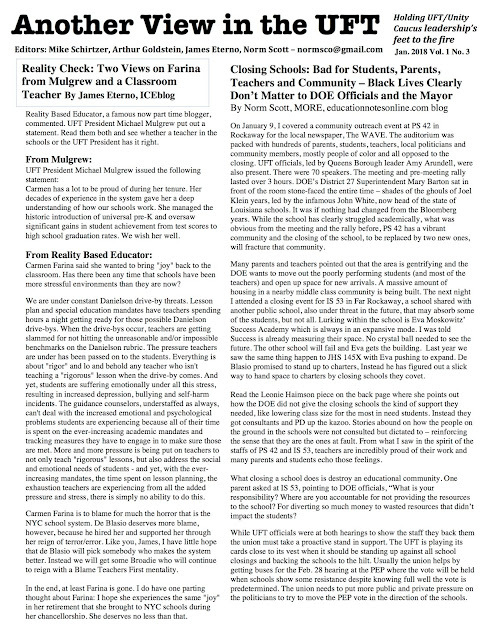 The UFT response to these attacks has been -- well, problematical - and I will address that in a follow-up post tomorrow based on a resolution we brought to the UFT Ex Bd this past Monday when District 4 rep Servia Silva, a pal of Supt Estrella, pretty much used the same argument the DOE used by saying none of the teachers - almost all replacements for those who left or were pushed out -- didn't oppose the merger. The MORE CASCADE committee is meeting at 4:30 to strategize for the meeting. It's a bit ironic to write you for a vote on a merger that has already happened. Writing almost makes me feel ashamed--as if I'm a cog pretending the DOE's process of public transparency, comments, and voting are real. PEP, please be aware that you are voting on a merger that has already occurred under the guise of, "sharing best practices." This is a false process. The merger has happened with zero community input. At the beginning of this school year, the school offices and classes were combined into one. The technology that was so well utilized at GTP was spread across the school and now has no management to enable the students to use the technology. Violence has grown in the school, with an increased need for police presence. Folks from the superintendent's office have to cover classes because of this merger that happened before you're voting tonight. Most devastating has been the impact on students with IEPs. GTP had 40% special education students, and they are now sitting in combined PS 7 classes, with several 12:1 students in general education classes. Their needs aren't being met, all because Alex Estrella wants to march forward with the orders given to consolidate without any consideration of what's best for children. As a former bilingual special education teacher, I find this reprehensible. A low-quality learning environment that disrespects the students that need it most--those of color and with disabilities. "The NYCDOE recognizes that students from Global Technology and P.S. 7 are combined in some classes due to teaching vacancies. The administrative teams at Global Technology and P.S. 7 are actively searching for candidates to fill the current special education vacancies to ensure that all students’ mandates are met." This is clear evidence that the DOE knows students with special education needs are not receiving the services mandated by their IEPs. WHY are there vacancies? Because when the GTP community would not agree with Estrella's attempts to merge the school in 2015-2016. From there, she terrorized the award-winning teacher and principal of the school. This was all to put into motion to merge the schools. And now that she's terrorized staff and combined the schools, special education students are paying the price. This is despicable. The DOE notes that teachers left for "professional" reasons. If escaping unethical behavior, bullying, intimidation, and educational professionalism is what the DOE calls "professional" reasons, the organization is in a very sad state. Estrella as a leader has not only destroyed the education of the students at GTP, she's also damaged the teachers that worked so hard to get the results GTP does. "The DOE commends the work of Superintendent Estrella". Is this with the exception of when she sold her house to a teacher and got fined 3k by the DOE? The DOE COMMENDS this kind of decision making? It's the same neurons she used to decide to sell a house to a teacher that were used to terrorize all teachers so that she force this merger, thereby special education needs are not being met. This is NOT commendable. What kind of standards is the DOE using these days? This is despicable--the students of East Harlem need and deserve better. While Estrella is a terrible leader, the DOE is the real culprit in this case, given that they support such substandard leadership. The comments note: "Issac Newtown" is a technology-based school in response to the community's concerns that GTP is the only tech-based option in the district. If the technological environment of Isaac Newton is the standard of what's acceptable for poor black and brown kids these days, then there's no question why there's such a deep digital divide. Never, ever would Isaac Newton be considered to meet the standards of wealthy children in this city or any city. I am truly offended and insulted that the DOE would have the audacity to claim that Isacc Newton meets the technological learning needs of the students of East Harlem. Once again, the DOE is showing through its actions in this merger a deep disrespect of a low-income community of color. Let it be known, undoubtedly, that closing GTP is taking the only high-quality technological school option. Pretending there's a substitute is a lie and shows blatant disrespect of the kind of education the students of East Harlem deserve. Given that GTP is the only tech-based option and served students with special needs well, the DOE needs to explain why it is being combined with PS 7, rather than PS 7's middle school being combined with GTP. There has been no reasoning or evidence provided as to why this hasn't been considered, nor has the isolated data of both middle schools been analyzed. The proposal notes that, "GTP can benefit from Hunter". GTP has ALWAYS had many programs: PENCIL, softball, Stuyvesant Prep, previous collaborations with Hunter, Citizen Schools, private business supports, track, etc. 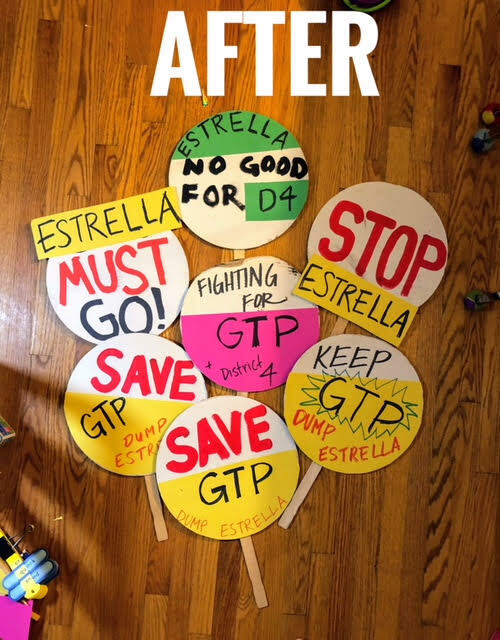 Any programs that have been removed from GTP are because of Estrella. To pretend this is about bringing resources to GTP when the school has been stripped under Estrella's leadership shows yet again a deep disrespect of disempowered low income students of color. Last, the public comments neglect to include the fact that Ann Weiner and Jacqueline Pryce-Harvey also put in requests to have their comments read at the hearing. Their requests were not honored. The record should reflect that they were not given access to speak at this event, and the options offered by the office of accessibility were not given at the hearing. PEP, the process in front of you is a facade. The merger has already happened, and the puppetry is in this voting. Stand up for the students of East Harlem. They deserve better. On Tuesday, Jan. 23, 2018, leaders of the Chancellor’s Parent Advisory Council (CPAC), representing all the PTAs and Parent Associations in NYC public schools, along with the leaders of the Education Council Consortium, representing the elected and appointed members of the Community and Citywide Education Councils, along with about 30 other parent leaders, gathered on the steps of Tweed Courthouse, the NYC Department of Education headquarters. As representatives of more than one million public school parents, they demanded that Mayor de Blasio implement a transparent selection process for a new Chancellor, and give parents a voice in this process, as he promised to do when he first ran for Mayor, instead of the quiet, internal decision that he currently plans. If there is a public vetting that includes the input of parents and community members, the likelihood will be that the next Chancellor will work well with parents and be responsive to their concerns. As the first step in devising this process, they asked to meet with the Mayor as soon as possible. Marco Batistella, Co-Chair of CPAC, Pam Stewart of the Citywide Council of Special Education, Eduardo Hernandez of the Community Education Council in District 8, Nancy Northrup of the Queens High School Presidents Council, and many other parent leaders explained why it was critical for parents to have a real voice in the selection process, to ensure that the next Chancellor will be successful in collaborating with parents for the benefit of NYC children. I'm putting up roughly 10 minute segments of students and will follow with teachers and parents from the remarkable hearing last week. Wednesday they are going to do it again at the PEP. I have two stories sent out by Leonie Haimson. Tuesday morning there is 10AM press conference at Tweed. Leonie asked me to come and tape it so I will have some video up, hopefully by Tuesday night or Wed morning. Wed night I am taping the PEP meeting and Saturday taping the parent conference. I will post reports. Are you fired up and ready to spread the word? Michael Elliott and Kemala Karmen have been producing a series of short films for NPE. I was at part of the shoot in April and it was so professionally done. That a high level film maker and editor like Michael is willing to do this shows his commitment to defending public education. The goal is to make them go viral and there is a social media strategy that can make this happen. See the guide below and also the quick things you can do if you can't handle the details of the guide. Here is a fun 6 minutes. Dr. Russell is abroad and sent in a statement (see below for the text) that trashes Estrella's leadership and ties in Farina too. She apparently has the right to have her statement read at the hearing by the presiding officer -- meaning Supt Estrella. How much fun to have Estrella reading her own trashing. Well--- I'll let you see how it turns out. With the likely support of former NYC Schools Chancellor Carmen Farina and other senior leaders, the superintendent of East Harlem’s District 4, Alex Estrella has moved forward with the merger of two public schools, Global Tech Prep (M406) and PS/MS007. Superintendent Estrella, with the support of the DOE, has violated the procedural rights of the East Harlem community, effectively merging the schools together in the 2017 portion of the 2017-18 school year. Her proposal, which was not scheduled for a hearing until January 18, 2018 and for voting on the 24th of this month, has already been enacted without consulting the community. This shows a deep disrespect from Estrella and anyone who supports her at the DOE on the procedural rights of the community, as well as a willingness to take advantage of a low-income community of color that may have limited time and means to organize, let alone access to the truth that a merger up for consideration has already occurred. Global Tech Prep, which at one point reached the 98th percentile citywide for achievement while serving nearly 40% special education students has been dismantled by the superintendent, who started on her merger plan at the end of the 2016-2017 school year. The school is the district’s only technology-based middle school (skills sorely needed in today’s modern world, especially with a documented digital divide between the profile of students served in East Harlem versus those in wealthier districts). The rights of the community to have a quality special education option, as well as a technologically based school have been yanked by the superintendent’s actions. This has occurred with zero community consultation. It also lead to multiple violations of the rights of some of our city's most vulnerable students--those with special education needs. There are countless IEPs not adhered to now that the merger has occurred and both schools are in disarray. 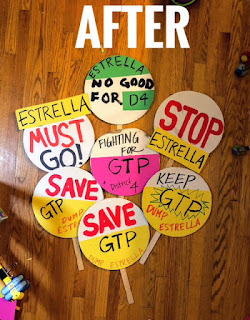 Since Estrella forced out the Principal and Assistant Principal of GTP, and then terrorized the teachers by denying them all tenure despite excellent performance records and recommendations from school leadership that they be given tenure, the school has fallen into disarray. This can all be traced to Estrella’s leadership moves. Her leadership has also caused significant disruption in the PS 7 community. Currently, the teachers at PS 7 are trying to rally against Estrella by not approving her selected principal by voting “no” in the C30 process, even though this makes them fearful for their jobs given her track record of removing anyone who doesn’t agree with her tactics. A merger may not necessarily be wrong (although in the eyes of many it is a travesty). However, a merger occurring in the 2017-18 school year with no community consultation (and a proposal being presented to the community for the 2018-2019 school year AFTER the merger has already happened) is a gross insult to the intelligence and rights of the community to be consulted before schools in their district. Superintendent Estrella, can you please give us an answer for the multiple parents who have contacted us about their child's IEP not being met since you illegally merged the schools without following procedural rights? Additionally, why choose to so blatantly deny the rights of a community that needs you most to be heard? Why must you abuse your power by not only terrorizing teachers and staff but also disenfranchising those that need a good education most--students of color with disabilities? Superintendent Estrella, if you can't follow the simple rules of how to sell your house without a founded conflict of interest, how can you be trusted to make a decision on which of our schools to keep opened or closed? As a public school educator for over 10 years with a doctorate of urban education policy, I can confidently say your leadership is one of the grossest violations of professional conduct I've ever witnessed. Our students, families, and communities deserve better. OK. So I went to yet another school hearing -- not a formal closing but a consolidation of two schools into one - but in effect the death of Global Tech. And this one - maybe above all - blew all of us away. The mostly former students were the stars of the show -with the support of their former teachers - most had left the school last year when Estrella chopped the principal and forced him out -- he is now at Harvard -- who showed up with the former students. camera a few times when there were some lulls -- but there were not many -- this was one of the most intense hearings I've been too-- but also joyous -- I chose to feature a shot of Kayla Hamilton one of the teachers who helped organize this and someone I've been in touch with over the past week. Watch the ovation she gets. She is one of the warmest, most exuberant people I've met. I would go back to school to have her as a teacher. We hugged her as we left and asked her what else can we do. She responded with, "No, what can I do? I'm an activist now." We will see Kayla and her crew this Wednesday night at the PEP at 166 Essex Street - starting at 6PM. CPE1 people will be in the house to support Global Tech. Come on down and see the show. And I will be posting shorter segments highlighting some of the dynamic speakers for those who don't have time to watch the entire video. Arthur, James, Mike and I began putting this out in November due to the lack of output by MORE at DAs other than when MORE has an issue to promote. We think there is a need for a regular communication to the chapter leaders and delegates even if most are Unity. Next month we address important contract issues like class size and observations and Danielson. Leonie and Elizabeth used to be pretty friendly - I was also friendly with her. Chalkbeat “Roundtable” discussion on Eliz. Green controversial piece in which she called Success charters a model educational system. See what I just tweeted about it below. The incredible bias of this piece in responding to critiques that the original piece was too biased makes me think that Chalkbeat editors must be trapped in a bubble w/o any awareness of how isolated they are. To close Global Tech is to actively discriminate against children with special needs, their families, and their rights to choose. Additionally, the superintendent has shown no consideration of how the increased number of special education students at PS 7 will be addressed, demonstrating her lack of concern and foresight in closing GTP, a school serving a high number of special education students. Shades of the charges against CPE1 - that teachers were running the school -- which I have always found to lead to the best run schools. But Farina and crew are out to stamp out strong teacher voices. The serious charges about neglect of special ed students may come back to bite the butts of Estrella and Farina --- expect the tonight's event and the Jan. 24 PEP to contain some fireworks --- look for videos to come. So tonight I'm dragging my old bones up to tape the hearing for merger of Global Tech and PS 7 in Harlem. Gloria, Myrie, Joan and Lisa from MORE are joining me and we have a very good leaflet produced by the MORE closing schools committee, which can be read at the MORE site: CASCADE – Campaign Against School Closings & Displacement Everywhere. I love the name CASCADE. And I love working with this committee of MORE even if I have some issues with some of the other ways MORE has been operating. 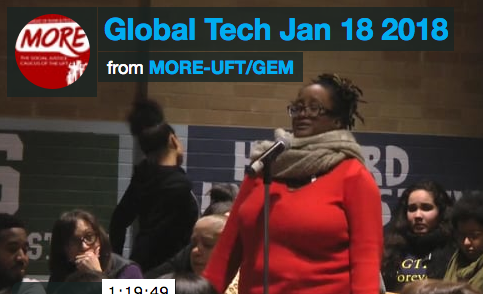 Global Tech Supporters Resist Consolidation Efforts of District 4 (East Harlem) Supt Estrella and Farina; Links of Estrella to UFT District Rep. I'm pushing our Ex Bd reps to challenge the union on Estrella at the Ex Bd meeting next Monday. Below are excerpts from email exchanges from former staff that expose the political manipulation and personal vendettas of District 4 (East Harlem) Supt Alexandra Estrella as she puts another notch in her belt of destruction. That she is an agent of Farina, there is no question. We talked about her relationship with UFT officials in yesterday's post. 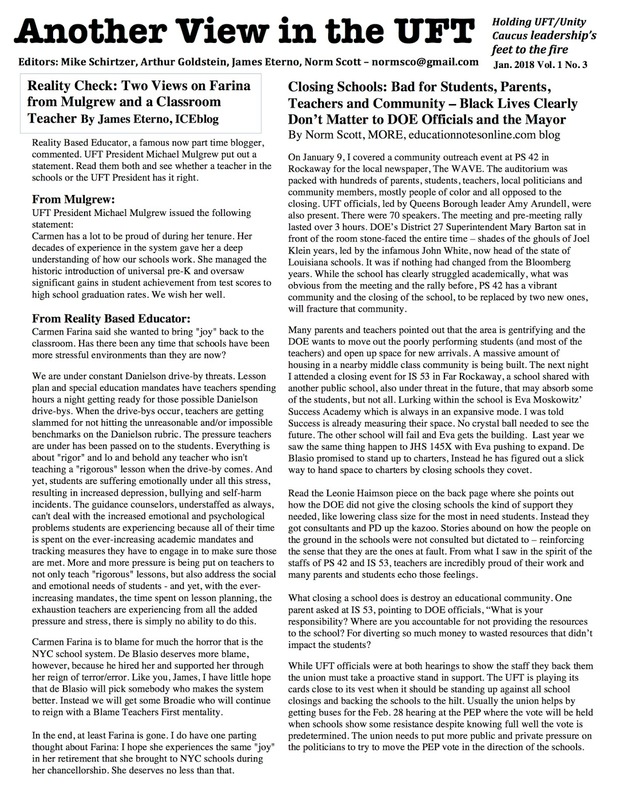 Our original April 23, 2017 report is here: CPE1 and Global Tech - East Harlem Dist. 4 Supt Alexandra Estrella: Evil Death Star School Destroyer). Here is some more background info from email exchanges. One point not addressed so far is the state of both schools since the " mock merger." The level of chaos and confusion that exists in the building is unacceptable. Teachers are on the verge of break downs and several have quit, others are planning their exit strategy for 2018. The new principals are both unable to control the rapidly increasing fights and classroom disruptions in the 6th grade. Special education students are placed in classes with no special education teachers. Students with 12:1 designation are in general education classes 70% of the day with one teacher. The claim that GTP students will benefit from a partnership with Hunter College is dishonest and shameful. Hunter College was not aware of the "mock merger" and were caught off-guard by the devastatingly negative impact on discipline and achievement. Hunter placed a consultant in the school to try to bring order to the chaos with little positive effect. Members of the superintendent staff have been actively involved in running the school and have acted as substitute teachers on occasion in an effort to stabilize lapses in leadership that could de-rail the partnership. IA Principal Graeber went from disparaging the collaborative efforts of the staff in 2016-17 as he described it: "the teachers have been running the school for too long" to desperately begging teachers to help to control classroom, lunch room and recess. This level of disrespect for collaborative leadership goes counter to 7 years of dedicated work at GTP with Russell and Baiz plus 2 years at PS 7 under GTP trained Dr. Harvey. The flaunted restorative practice and designated classroom space is so dysfunctional that teachers are volunteering to man more structured detentions and suspensions during their lunch periods, as a last-ditch effort to save the school year. This "mock merger" has to be brought back to the discussion and negotiating table with ALL STAKEHOLDERS represented. There is no other technology-based school in the district, which serves a population of high-needs students. With the skills needed to be successful in today’s technological world and an already burgeoning achievement gap between students with resources and those without, how can we close the one tech school in the district? What is the technology plan? Each student at Global Tech Prep has a laptop, but more importantly, the kind of education that teaches them to be digital citizens in today’s complex world. There is no mention of how the very needed skills involving technology will be addressed in the superintendent’s proposal. Based on the need for a technology school alone, why isn’t a formation considered where PS 7 would focus on PreK-5 and Global Tech on 6-8 for the community? The community deserves to have this choice. This addresses the lowered enrollment, which is something happening across ALL public schools in the district (this is fueled by the exorbitant number of charter schools in the district). It seems there’s been no comparison of which of the two middle schools better serves the community, which should be a key part of the evaluation of closing an existing middle school. Where is this comparison—breaking out the 6-8 of PS 7 and comparing it to Global Tech (and looking both at and beyond test scores) to support this decision? Special education students comprise 39% of the population at Global Tech Prep, and many parents choose the school because of how well the school educates students with special needs. Closing GTP means special education parents of East Harlem have few choices for schools that really understand and can serve special education students at the level GTP can. Furthermore, closing GTP (M406) is against the principles of the laws that govern special education—every child has the right to a free and appropriate education. The standards of “appropriate” special education at other schools in the district don’t come close to the kinds of outcomes and work Global Tech does with special needs students. To close Global Tech is to actively discriminate against children with special needs, their families, and their rights to choose. Additionally, the superintendent has shown no consideration of how the increased number of special education students at PS 7 will be addressed, demonstrating her lack of concern and foresight in closing GTP, a school serving a high number of special education students. A data analysis of the progress made by special education students in each school at the 6-8 level is essential in making an informed decision about what's best for children, especially those with special needs. Additionally, considering the impacts of each of children with IEPs not having access to a laptop for each class (which has been essential for their success) has also not been considered. The proposal mentions Hunter College as a benefit coming from PS 7. Has Hunter confirmed they won’t support both schools? For example, in the Case of Citizen Schools, the program began at Global Tech and supported both. Seems the superintendent has orchestrated Hunter's support to achieve her goal of consolidating the schools based on demands from central offices. This proposal is for 2018-2019. However, teachers and students at the schools report that all Global Technology signs have been taken down and that the classes between the schools are merged. Effectively, this means Alex Estrella has already merged the schools in practice before the community has made a decision and the appropriate procedural processes have been followed. This isn’t a proposal open for the East Harlem community’s comments, it seems. Through already combining the schools, the superintendent has shown she neither honors the process for a school closure/merger, nor does she respect the community’s rights to give input and be heard when it comes to the educational futures of their children. I was contacted by people connected to Global Tech based on this April 23, 2017 post: CPE1 and Global Tech - East Harlem Dist. 4 Supt Alexandra Estrella: Evil Death Star School Destroyer. On January 24, the PEP will vote to consolidate two schools - Global Tech and PS 7. There is an ugly story behind this move. That District 4 Supt Alexandra Estrella continues her vendettas -- many claim she is in the running for worst Supt in the city -- and note below her very close relationship to UFT District Rep Servia Silva. Is the UFT behind protecting Estrella's back despite her viciousness? Google Estrella to see the number of scandals she has been involved in. Estrella chopped a very popular teacher who was groomed to be the principal last spring. He is now at Harvard. Most of the teachers then left the school and are scattered around but many will be coming out tomorrow to the school to protest the consolidation and, in essence, the destruction of the mission of Global Tech. There will be a hearing at the school this Thursday Jan. 18 - I and some other MOREs are going and I will be taping. We're betting the UFT will be mum on this move. Here is some of the background based on Andrea Gabor's reports from April. I'll be back with more updates later. Estrella who tried and is still trying to destroy CPE1 may be the worst Supt in the city. 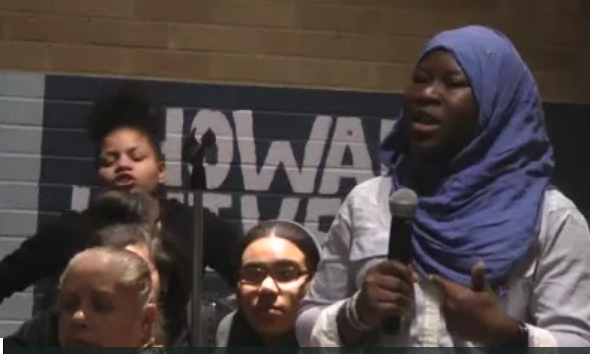 But just as bad is the connection between Estrella to the UFT District Rep Servia Silva, whom many teachers in the district accuse of being Estrella's cover. I just heard from someone in the district that Estella and Silva have vacationed together. I have been in phone contact with some of the people actively organizing resistance. I will publish more info as this week goes on. One of the ugliest are the stories of a very buddy buddy relationship between District 4 Supt. Alexandra Estrella and UFT District Rep Servia Silva. One report claimed that Estella and Silva have vacationed together. Talk to people at CPE1 and they will tell you how they suffered abuse from principal Monika Garg while Silva poo poohed it. I called Silva out when I last spoke at the UFT Ex Bd pointing out that CPE1 teachers came to MORE for help due to UFT lack of response. There are about 4 hours of videos. It was a busy week last week and another one coming up over the closing schools issue. We have a here. Black Lives clearly don’t matter to DOE officials and the Mayor despite the rhetoric. On January 9, I videotaped (see below for links) the closing school informational session at PS 42 (there will be a hearing at the school on Feb. 13 at 6PM). The auditorium was packed with hundreds of parents, students, teachers, local politicians and community members, mostly people of color and all opposed to the closing. UFT officials, led by Queens Borough leader Amy Arundell, were also present. There were 70 speakers. The meeting and pre-meeting rally lasted over 3 hours. DOE’s District 27 Superintendent Mary Barton sat in front of the room stone-faced the entire time – shades of the ghouls of Joel Klein years, led by the infamous John White, now head of the state of Louisiana schools. It was if nothing had changed from the Bloomberg years. DOE officials looking on obliviously while children and their parents and teachers pleaded to keep their community intact. The school has clearly struggled academically but has managed to triple its growth from what was obvious from the meeting and the rally before, PS 42 is vibrant and the closing of the school, to be replaced by two new ones, will fracture that community. Patricia Finn, principal for seven years, received so many accolades I could see her blushing from across the room. But raves for her humanity and caring, in education based on the numbers, doesn’t count for much. Many parents and teachers pointed out that area of Rockaway is gentrifying and the DOE wants to move out the poorly performing students (and teachers) and open up space for new arrivals from the additions to Arverne by the Sea. The next night I attended the closing event for IS 53 in Far Rockaway (the closing hearing at the school is on Feb. 7 at 6PM), a school shared with another public school, Village Academy, also under academic threat. VA may absorb some of the students, but not all. Lurking within the IS 53 building is Eva Moskowitz’ Success Academy, always in an expansive mode. People said Success is already measuring their space before the February 28 vote at the Panel for Educational policy. No crystal ball needed to see the future. Village Academcy will be squeezed and Moskowitz gets the building to add to her growing empire, a school system within a school system. A school system known to push out poor performing students and kicking them back into the public schools. Last year we saw the same thing happen to JHS 145 in the Bronx, with a Moskowitz school in the building pushing to expand. De Blasio promised to stand up to charters, Instead he has figured out a slick way to hand space to charters by closing schools they covet. Parent groups have pointed out how the DOE did not give the closing schools the kind of support they needed, like lowering class size for the most in need students. Instead they got consultants and PD up the kazoo. Stories abound on how the people on the ground in the schools were not consulted but dictated to – reinforcing the sense that they are the ones at fault. From what I saw in the spirit of the staffs of PS 42 and IS 53, teachers are incredibly proud of their work and many parents and students echo those feelings. While UFT officials were at both hearings to show the staff they back them the union must take a proactive stand in support. The UFT is playing its cards close to its vest when it should be standing up against all school closings and backing the schools to the hilt. Usually the union helps by getting buses for the Feb. 28 hearing at the PEP where the vote will be held when schools show some resistance despite knowing full well the vote is predetermined. The union needs to put more public and private pressure on the politicians to try to move the PEP vote in the direction of the schools. Norm feels the pressure all the time and also posts the PS 42 and IS 53 videos at ednotesonline.com. In the DOE black lives clearly don't matter. I have 5 hours of video to process and will be putting up the wonderful comments of parents, teachers and students, so keep an eye out. For now put up with me for 2 minutes. Jeez, am I really that bald? Deb Meier one of my heroes since I first heard of her in the 70s. WAPO ed columnist Valerie Strauss has been on the side of real reform for a long time.